National Geographic Kids Almanac 2015 by National Geographic Kids. Review: Do you know what was found in a lake in Louisiana? A pink dolphin! People can learn facts like this in National Geographic Almanac 2015, a nonfiction reference book. It has many interesting facts about science, animals, events all around the world, and other topics. The book National Geographic Almanac 2015 contains sections on a variety of topics. One section, ÒOur World,Ó tells about events like the Women's FIFA World Cup, inventions like real light sabers, and animal species like a flying frog. Amazing Animals includes facts about animals. It tells about animal relationships, families, tricks, cute animals, and naughty pets. Also, facts about helping the environment are explained in the section Going Green. In addition, Awesome Adventure tells about jobs, facts about survival, and extreme sports. Furthermore, Super Science and Wonders of Nature have facts about space, eyes, rocks, disasters, weather, and biomes. Fun and Games includes different activities you can do. Facts about horoscopes, foods, languages, and mythology fill the section Culture Connection. Another interesting section, History Happens, informs the reader of presidents, cultures, and government. ÒGeography RocksÓ contains facts about continents, oceans, landforms, weird things like an apple-shaped racecar, vacation spots like Hawaii, and roller coasters in the chapter. In summary, there are a wide variety of sections in National Geographic Almanac 2015. National Geographic Almanac 2015 was amazing. I would recommend it to anybody who is interested in nonfiction and learning. This book includes cool facts, photos, quizzes about each section, an activity section, and homework helps. The Almanac covers topics about everything from dolphins to Earth. My favorite sections are Amazing Animals, Super Science, and Culture Connection. It includes cute animals like meerkats, Amazonian milk frogs, harp seals, baby Emperor penguins, deer, and pandas and gross animals like the puss moth caterpillar. If you think that insects are gross, stay off of page 56. Those who are interested in science, history, geography, and nonfiction will like the book National Geographic Almanac 2015. It has fun family activities and cool crafts. Since so many topics are included, it has something everyone will enjoy. This book exceeded my expectations, and I hope you will like this book as much as I did. Review written by Anna (6th grade student). We would like to thank National Geographic Kids for providing a copy of National Geographic Kids Almanac 2015 for this review. 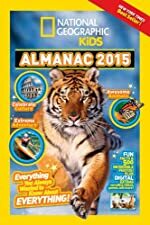 Have you read National Geographic Kids Almanac 2015? How would you rate it?